Aloe Vera has been one of those mystical plants. People talk about its healing properties, many of which have been well documented and publicized. Today I want to discuss some of the lesser known things about Aloe Vera. Hopefully you will find this educational and entertaining. Scientists aren’t really sure of the natural range of Aloe Vera. It is suspected that there were once large stands of Aloe Vera in the natural habitat, but tracing exactly what that habitat was has proven to be a challenge. Finding the original range has been made more difficult because it has been so widely imported because of its popularity as a folk medicine. The earliest known reference to medicinal use of Aloe Vera comes from the 16th century BC in what is known as the Ebers Papyrus, a scroll documenting the medical knowledge of the time. The Ebers Papyrus contains around 700 remedies. Aloe Vera is a member of the lily family, and is related to garlic and onions. Who knew? The topical use of Aloe Vera is not connected to any significant side effects! 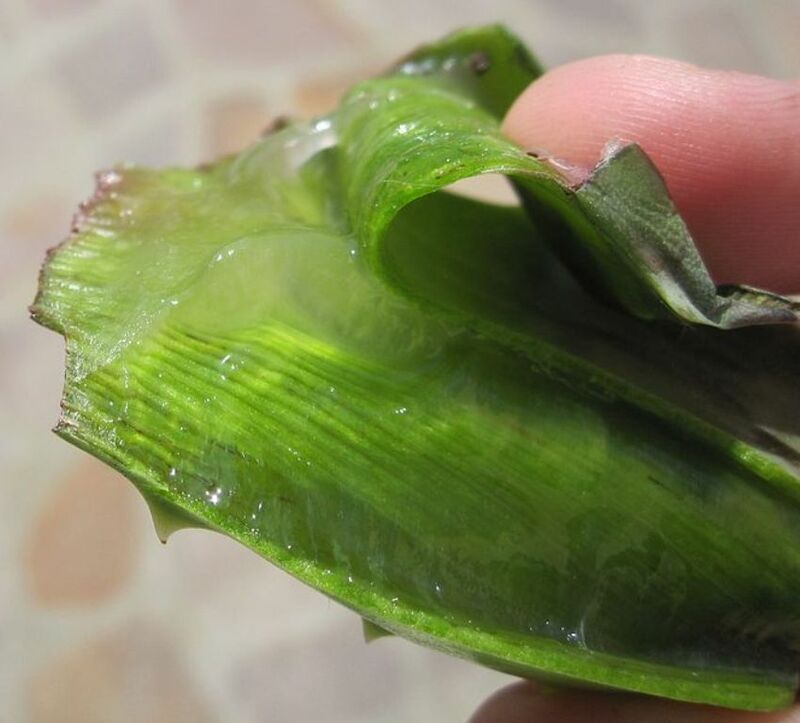 Aloe Latex, known as Aloin, surrounds the “gel” part of the inner leaf was the first commercially used part of the Aloe Vera plant. It was used for many years as a laxative. Aristotle taught Alexander the Great about using Aloe Vera for treating wounds and other ailments. Alexander supplied his military with Aloe Vera when they went to battle. Cleopatra used Aloe Vera as a part of her daily skin care regimen. The flower of the Aloe Vera plant grows on a single spike from the center of the plant. The spike can grow to be 3 feet tall. The flowers have both pistils and stamens, but the pollen in each plant is produced before the female flower has fully matured to prevent the plant from pollinating itself. There are over 240 known varieties of Aloe Vera plants. Only four varieties are commonly used commercially. Aloe Vera plants can live to be over 100 years old! Posted on October 6, 2016 by Brian Berry and tagged Aloe Aloe Vera AloeVender 21 Day Challenge. What are Some of the Different Kinds of Lavender Essential Oil? One of the first things I learned when I was creating the formulation for AloeVender is that there are many kinds of lavender essential oils. Each has different properties, and some are less desirable than others. This is not a comprehensive list of all varieties of l, rather a compilation of the types of Lavender Essential Oil that are commonly used today. Lavender (40/42) - Lavender (40/42) is an essential oil that is a blend of several types of lavender where the blend contains 40-42% aroma esters. Lavender (40/42) is not considered to be a highly therapeutic essential oil, but it is commonly used in many products because of its consistent floral aroma. Soap and lotion makers often use this essential oil to maintain consistency in the scent of their products. Lavender (Bulgarian) - This essential oil is considered to be highly therapeutic. It is also considered to be the nearest in aroma to fresh lavender. Both of these traits cause it to be highly sought after for both therapeutic uses and to add scent to products. Lavender (French) - This essential oil is derived mostly from lavender grown in the Provence region of France. It has a very floral scent and is considered to be very therapeutic. Lavender (French) is widely used in aromatherapy. We use this essential oil in several of our products. Lavender (Maillette) - This variety is from a hybrid variety of lavender. The flowers on this variety of lavender are typically blue in color and are commonly grown throughout Eastern Europe. This is considered to be a very therapeutic essential oil. Lavender (Moldova) - As the name indicates, this essential oil is derived from lavender grown in the Eastern European country of Moldova. It generally has a sweet, earthy aroma. Lavender (Mont Blanc) - Like Lavender (Population), this lavender is grown at high altitudes. It is grown in the Western European Alps at altitudes of 15,000 feet and above. It is considered to be a very highly therapeutic essential oil. Lavender (Population) - This essential oil is a premium blend and is considered to be highly therapeutic. It is a blend of lavender that is all grown at elevations of 3,000 feet or higher. The dry climates and long days of sunlight create a mellow, sweet essential oil. We are using this premium blend in products that we will be introducing in the very near future. Lavender (South African) - Sourced from South Africa, this essential oil has a strong floral scent, and has stronger camphor notes than other lavender essential oils. Lavender (Spanish) - This is considered to be an inferior grade of lavender essential oil and is not considered to be a therapeutic oil. It typically has a medicine smell. Posted on October 5, 2016 by Brian Berry and tagged Lavender lavender essential oil types of lavender. This was the classic line from Field of Dreams. And it was a very compelling line. But it was also a lie. At least as far as opening a business online goes. Don’t think I’m complaining, because I’m not. But one of my big lessons in the first year is that just making a product and putting it up on a website is absolutely not enough. Not even close. Maybe that would have been enough in 1995, when there wasn’t a lot of competition on the internet. But the internet has become a very crowded marketplace. Being heard above the fray is very difficult, and it is something I’m still learning. It is especially difficult when you are the new guy on the block. Sometimes it is frustrating, sometimes it is invigorating, sometimes it is fascinating, sometimes it is confusing. But every day - absolutely every day - you learn something new. And that is amazing! And that is a big motivator for me. I’ve also learned that making AloeVender is hard. Very hard. It took many failed efforts to come up with a workable formula. It has been the classic case of three steps forward, two steps back. The current formula is very good. Far better than the early attempts. I find it to be very effective, and the feedback has been incredibly positive! When I look back at where I started compared with where I am today, the journey has been amazing. When I came up with the idea for AloeVender, I had absolutely no idea the number of bumps I would have along the way. Making a product like this is pure chemistry. There isn’t a lot of room for error. Something as simple as changing the order of the process can cause a complete failure, resulting in a significant financial loss due to wasted raw materials. Building a Company is Awesome! I love every day I spend working on AloeVender. I love the products I’ve come up with, and love the idea that my products are helping people! Hearing from customers and getting their feedback feels great! I am so excited about what I’m building, that I can hardly contain myself! There are a lot of rules to learn and follow. FDA, IRS, FTC and on and on. The FDA is the most difficult. I have spent hundreds of hours poring over their regulations, and I focus on their rules and guidelines every step of the way. When you are trying to build a business, more people want to see you succeed than want to see you fail. People WANT to help you. Let them! I’ve had people offer consulting services, people buy my products (and OVERPAY), help me find venues to sell my products in person, sell my products to their friends, etc, etc, etc. I am eternally grateful to those who have helped me, and I look for opportunities to pay it forward. Posted on October 4, 2016 by Brian Berry and tagged What I've Learned 21 Day Challenge Building an online presence First Year. In an effort to improve my writing (both frequency and quality), I will be posting new blog entries more frequently for a bit. Much more frequently. This is in response to a challenge issued by Omar Zenhom (founder of the $100 MBA). His challenge is to write five blog entries per week for three weeks. This entry is the first of the series. Throughout the next three weeks, I will be posting a new blog entry nearly every day. If you are not familiar with Omar Zenhom, he is a serial entrepreneur who does a daily business podcast, each of which is a short (15 minutes or less) lesson aimed at helping entrepreneurs (or would-be entrepreneurs) to learn how to advance their goals. I highly recommend checking out his podcasts. Taking risks in what I write about. I tend to be overly cautious and filter my inner voice when I write...especially when writing for business. I plan to use this exercise to break free from that habit (or at least to reduce my tendency). Entertaining the readers. I hope you will find some entertainment in these posts. I’ll try to keep them entertaining, and hopefully you will find something that will make you snicker...or better yet, have a full on Spit Milk Out Your Nose laughing fit. Getting into the habit of regularly writing on the blog. Of all that I do as part of this company, blogging is the most neglected. I want to focus more on it. I want visitors to AloeVender.com to see that there is a real person behind the company. We are not just some faceless corporation. The first part of the challenge was to plan the 15 blog entries so that there isn’t the stumbling block of, “what do I write about today?” I’ve done that, but I may call an audible here and there as I think of other topics to write about. And if you think of something you’d like me to write about, drop me a line (brian@aloevender.com). I’d love the challenge of writing about what you’d like to see me write about. Posted on October 3, 2016 by Brian Berry and tagged Aloe Aloe Vera Lavender AloeVender Aloe With Lavender. I love BBQing and I love salmon. I especially love combining the two. I often hear the phrase, "Do you want to come over for a BBQ tonight? I bought salmon and you're cooking." I'm not really that spectacular. I have just spent some time playing with salmon and hit upon the combination that works for me. Note: This recipe uses Lavender Gourmet Seasoning from Ali'i Kula Lavender Farm. We are not affiliated with AKL, and do not get any compensation should you choose to order their seasoning. We just love it. 1. Order some Lavender Gourmet Seasoning from Ali'i Kula Lavender Farm. It is a fantastic spice blend that has lavender, macadamia nuts, salt, brown sugar and other herbs and spices. Order some now so you have some on hand when fresh salmon is in season! 2. Get your hands on some cedar grilling planks. Most grocery stores carry them. You can also get them on Amazon.com. You can also save some money by buying untreated cedar from your home store or lumber yard and sawing it to length. Just make sure it is UNTREATED cedar. 3. Soak the cedar for at least an hour (2+ hours if you have the time). The point is to make sure it is fully saturated. You can use a large, deep cookie sheet for this or a large baking dish. I like to weight it down with a couple of glasses of water or some canned goods. Flip the plank(s) periodically to ensure that they are completely saturated. 5. When the planks are well soaked, light the grill and warm it up to a low-medium heat. 6. Place the salmon on the saturated plank, skin side down. Place the plank on preheated grill and shut the lid. 7. The plank will start to smoke. That is good. The aromatics from the cedar plank will add flavor to your salmon. Cook it for 30 minutes, or until done. Do not over cook! Salmon is best when it is light pink on the outer portion, with slightly darker pink in the middle. I like to serve this with grilled asparagus (bonus recipe: coat asparagus in olive oil, toss with sea salt, grill for ~7 - 10 minutes until caramelized and deeply colored, turning to cook evenly). Posted on April 5, 2016 by Brian Berry and tagged salmon bbq lavender akl cedar plank fish best salmon ever. AloeVender was born on Maui, so it was only fitting that I visit the Ali'i Kula Lavender Farm on my recent trip to Maui. I have been to Maui many times, but this was my first visit to Ali'i Kula. The farm is high up on Haleakala - about 4,000 feet above sea level. The views from the farm make the trip worth the drive. They charge a very nominal admission fee of $3/person to visit the farm. They recommend reservations, but the day we went (a Sunday in late January), we had no problem getting in without them, although the parking lot was very full. We started our day early, leaving our condo in Maalaea around 8:00am. A quick stop at Costco for gas, and then we headed up for breakfast at Grandma's Coffee House in Keokea. Grandma's is definitely a highly recommended spot for breakfast and coffee. Go on a weekend, when they server an amazing version of Eggs Benedict served on cornmeal waffles with your choice of meat (I opt for the Mahi Mahi over turkey, bacon or ham). The Bullseye Breakfast (a mound of rice circled with slices of spam and topped with eggs, with a target drawn in ketchup) is also a great choice, but if I happen to be there on a weekend I always go for the Benedict. The line can be long, but the wait is more than worth it. When you get in line, pop up to the front and grab a menu so you are set when it is time to order. The drive from Grandma's Coffee House to Ali'i Kula is pretty short - maybe 12 minutes. The road into the farm is narrow in spots, so keep your speed down and be careful on the curves. When you get to the farm, be sure to look for the parasailers above the farm. When the weather conditions are right, you can see many people flying at once. It is an incredible sight! The farm itself is spread around the grounds, comprising over 13 acres of land. The self-guided tour winds around several loops through gardens highlighting some of the vegetation found on Maui. The self-guided tour takes about 25 minutes (for our group) and is included in the $3 admission to the farm. They also offer a guided walking tour and a motorized cart tour for an additional fee. The gift store is a must-see on the trip. They have an amazing assortment of lavender products, many are under their own label, but they also have some items produced by other manufacturers (such as Formulary 55). They have several soaps, lotions and moisturizers. I highly recommend the Lavender Gourmet Seasoning! It is fantastic! I also picked up their culinary lavender...I'm not sure how I'm going to use it yet, but I'm sure it will be great! Posted on January 26, 2016 by Brian Berry. Parabens are esthers of p-hydroxybenzoic acid. They are widely used as preservatives in the cosmetics industry. They are easy to spot on ingredient labels because they all have paraben in their name (butylparaben, heptylparaben, methylparaben, propylparaben). They are often combined to provide protection from contamination against a broader range of microorganisms. So you might see propylparaben and methylparaben in the same product, as the chemist who created the formula for the product was trying to create a product that would be as safe from contamination as possible. There has been a fair amount of controversy surrounding the safety of parabens. This stems largely from a UK study that determined that in a sample of 20 breast cancer tumors, all of them were found to contain trace amounts of parabens. While the tumors in the study were found to contain parabens, there has not been any research that has shown that parabens actually cause cancer. Parabens have been shown to have estrogenic activity, and estrogenic activity has been associated with some types of breast cancer. Unfortunately, there have not been sufficient studies to prove or disprove the absolute safety of parabens. We believe that additional studies are needed before paraben safety can be determined. Currently parabens are allowed in products in the US and the EU. They are inexpensive and effective at preventing microbial growth in personal care products and cosmetics. Because there is some question as to the safety of parabens, and because there are effective alternatives, we choose to not use parabens in our products. It is an easy choice for us to make.We see is as a benefit that we pass on to our customers. The preservative that we use, Optiphen Plus (which is a combination of Phenoxyethanol, Caprylyl Glycol and Sorbic Acid), is accepted worldwide and is universally accepted as being safe and effective. Posted on January 11, 2016 by Brian Berry and tagged paraben safety aloevender. November 29th: First drawing - $25 iTunes Gift Card - Winner: Mary Martin! Congratulations! December 6th: Second drawing - $25 Amazon Gift Card - Winner: Ryan Everts! Congratulations! December 13th: Third drawing - $25 American Express Gift Card - Winner: Evelyn DeFrisco! Congratulations! December 20th: Final drawing - $25 Amazon Gift Card, one bottle of AloeVender and 1 bar of soap. Winner: Cathy Cunningham Stermer! Congratulations!!! Posted on January 11, 2016 by Brian Berry. Last Thursday I had my first public sales event. Well, semi-public, anyway. It was at my place of employment. You know, my day job. Sales went extremely well. In fact, that one day exceeded my sales goals for the entire month of October! The soap was very popular. A lot of people were snatching it up for gifts. I had a few customers come back for more! That was very rewarding. I also have been contacted by a few people asking for bulk orders and for custom varieties (using essential oils other than lavender). I expected the moisturizing lotion to outsell AloeVender, but that was not the case. AloeVender sales were triple that of the moisturizing lotion. People really seemed to understand the value of a good Aloe Vera gel combined with lavender and vitamin E. I tried to steer a couple of people towards the moisturizing lotion because I thought it more closely fit what they were looking for, but they wanted the higher Aloe Vera content of AloeVender (which is over 95% Aloe Vera juice!). It was an incredible event. Based on this experience, I will be seeking out more public events so that even more people can try the products in person and see first-hand how nice our products are. Posted on October 19, 2015 by Brian Berry. Aloe Vera is a succulent plant that belongs to the same family that onion and garlic belong to. It is a plant with medicinal properties that has been used by human beings since time immemorial. This plant can be easily grown in pots inside your home to receive all its health benefits. Different parts of Aloe Vera plant are used for different purposes and its extract can not only be applied topically but also consumed internally as a juice. Aloe Vera is a pant that contains more than 200 active compounds. It is full of vitamins, minerals, and enzymes. No wonder then that it is used as a remedy in so many ailments. The gel contained in the leaves of Aloe Vera is full of polysaccharides that are known to boost the immunity levels of an individual. Regular consumption of Aloe Vera juice reduces inflammation and improves the immunity of the user to prevent common ailments. Aloe Vera plant is full of minerals and amino acids that make it one of the best cleansers in the plant kingdom. Consumption of Aloe Vera juice aids in digestion and also helps in elimination of waste from the body. It works as a detoxifying agent inside the body and reduces symptoms of indigestion. It provides relief in inflammatory diseases and menopause. Though there is no conclusive evidence to prove this, it has been found that regular intake of Aloe Vera juice helps in lowering high cholesterol levels inside the body. It also helps in lowering blood sugar levels. Thus Aloe Vera is considered beneficial for the health of those suffering from diabetes and hypertension. It is also considered good for the cardiovascular health. Aloe Vera gel has been used topically by humans for thousands of years to treat cuts and burns. It is antiseptic in nature and soothes inflammation of skin. Aloe vera is also an analgesic. It helps in providing relief from pains and wounds. Applying cold aloe vera gel on sun burnt skin gives a very soothing effect. It is also very good for the health of hair as it contains many vitamins and minerals. This is the reason why aloe vera is used as an ingredient in many cosmetic creams and lotions. Posted on September 22, 2015 by Brian Berry. Please sign up for our mailing list to receive new product notifications, periodic newsletters and special sales.